As this is my first post, I suppose that an introduction is in order. I grew up being a believer in Christ. I am, also, a very observational person. Often, questions will pop-up into my mind and I will spend hours on Google, searching for an article that poses a similar query. I love to study different subjects from all angles, so as to be sure that I am 100% confident that what I'm speaking of is true. About 5 years ago, my curiosity took me to study archaeological evidence of different Biblical events. I was honestly searching for secular proof of my faith, as all that I had ever known was "evidence" that was taught in the church and within Christian articles. It started with Noah's Ark, then, the Exodus, then, studies of original text dates of the New Testament. 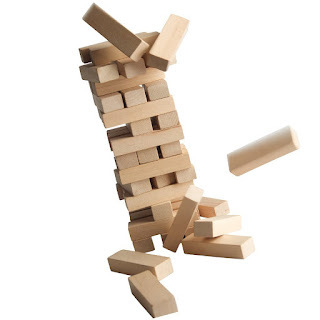 That's when my "Jenga puzzle of faith" slowly started to come apart.The problem was that, other than the typical "faith-based" evidence, there was no actual evidence to speak of. In fact, I found numerous articles and studies DISPROVING those subjects. That's when my "Jenga puzzle of faith" slowly started to come apart. It didn't happen overnight. It took about 3 more years studying to completely fall down. However, throughout my journey, I have never felt bitter toward Christianity or Christians. In my future posts, I will be commenting on various observations of Christians, Christian behavior, and Christianity itself. I am not here to bash Christians, or anyone for that matter. I just have a desire to present my experiences and thoughts to this community.